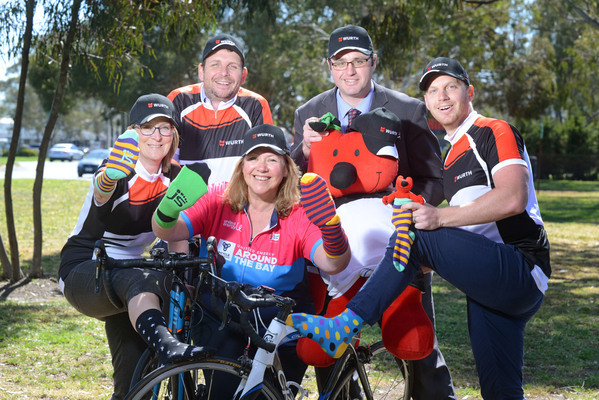 Cyclist Leonie Hussey and 15 colleagues from Wurth Australia Dandenong are joining 10,000 bike riders in Australia’s biggest bike ride United Energy’s Around the Bay. This will be Leonie’s second time participating in the 100km Melbourne to Frankston return ride to be held on the 7 October. Leonie will be raising money to support the one in seven young Australians currently living below the poverty line. The money raised will help young people in need with practical support for their education. These items will include books, uniforms, shoes, and access to out of school learning and mentoring programs. “Education makes such a difference in young people’s lives, so we can’t wait to show our support next month by riding strong for kids in need,” Leonie said. Leonie says she has been impressed by how many of her colleagues have taken up the charge. “They saw us ramping up our training, heard about the great cause, and said to themselves I’ll have a go, she said. In order to raise more money for the foundation Leonie and her colleagues are also selling boxes of socks. “Every dollar raised by riders will help the Smith family reach more young people in need with practical support for their education,“ Leonie said. Anton Leschen, the general manager from The Smith Family foundation, congratulated Leonie and her colleagues for their generous commitment. “Our nationwide Learning for Life program helps break the cycle of disadvantage for tens of thousands of children in need , and the more money riders raise, the more we can help”, he said.